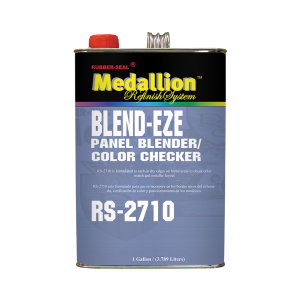 Blend-EZE is a unique blend of premium solvents and resins designed to be used as a panel blender for 2K clearcoat systems and single-stage urethanes. It is compatible with most major clearcoat, basecoat and single-stage urethane systems. Simply, reduce remaining clearcoat with RS-2710 at 1:1 mix to melt in edge and then spray without reduction to melt in featheredge. RS-2710 can also be used to check color match or as a wet-bed sealer. Available in quarts and gallons.